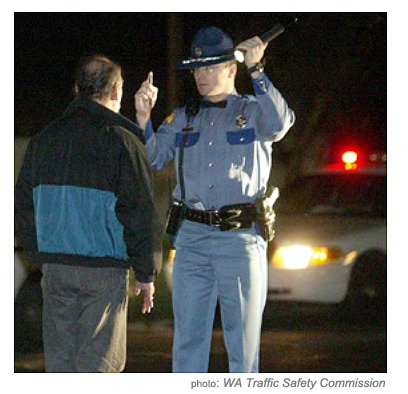 OLYMPIA—Starting this month, most Washington drivers renewing their licenses will have an additional year until their next visit to the Department of Licensing as the state transitions from a five-year driver license renewal cycle to a six-year cycle. By extending the renewal cycle to six years, drivers in our state won’t have to visit DOL offices as often. Over time, this change also will reduce the number of drivers and ID card holders visiting DOL offices each year. This will help keep wait times as low as possible for all our customers. The cost of a basic driver license or ID card will remain at $9 per year, but most customers will be paying for an additional year, so the total renewal cost will change from $45 for five years to $54 for six years. Moving to a six-year driver license is expected to reduce the average number of annual renewals by more than 100,000. In order to evenly distribute all of our state’s licensed drivers into six years of roughly equal and lower renewal volumes, some drivers will be selected to receive a license extension for less than six years. Beginning August 10, approximately 20 percent of drivers with licenses expiring in October will be selected at random by DOL’s license issuance system to receive a five-year license. The remaining 80 percent will receive a six-year license. DOL will continue this gradual transition for the next five years by selecting 20 percent of drivers each year to receive licenses valid for less than six years. During the second year of this process, 20 percent of drivers will get a license valid for four years. In the third year, 20 percent will get a license valid for three years. In the fourth year, 20 percent will get a two-year license. In the final year, 20 percent will receive a one-year license. Drivers randomly selected to receiving shorter renewal periods will only pay for the number of years their license is valid and will be eligible to renew online. Click here for more info on DOL’s website. 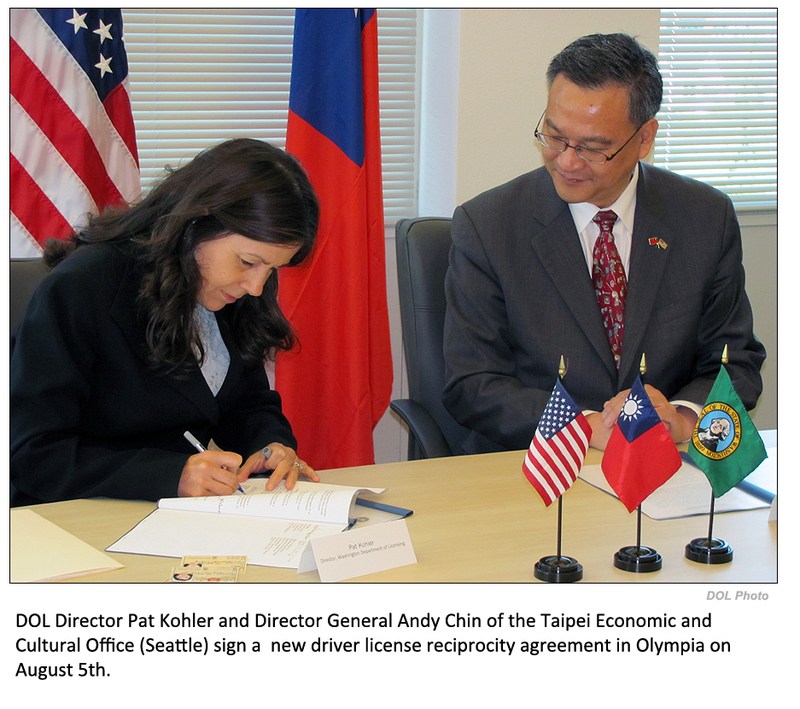 OLYMPIA— A new driver license reciprocity agreement between Taiwan and Washington state will make life a little easier for drivers wanting to transfer a license from one place to the other. The agreement allows Taiwan nationals living in Washington, such as university students, to skip the driving and written licensing exams if they are already licensed to drive in Taiwan. It gives the same option to Washington residents living in Taiwan. “This agreement allows the Department of Licensing to honor the driving tests previously taken by a citizen of Taiwan just like we would when serving a currently licensed driver from another state,” Department of Licensing Director Pat Kohler said. Driver licensing officials here and in Taiwan worked together to evaluate each other’s driver licensing requirements and testing processes. This ensures drivers who hold either license are fully qualified to operate a vehicle safely in both places. The agreement was finalized at a signing ceremony on August 5th in Olympia. Director General Andy Chin of the Taipei Economic and Cultural Office in Seattle joined Licensing Director Kohler in signing the agreement. The agreement takes effect immediately. Drivers from Taiwan seeking a Washington license will need to visit the Taipei Economic and Cultural Office in Seattle to have their current license properly translated and verified prior to visiting a DOL driver licensing office. Lt. Governor Brad Owen signed the agreement as a witness when it was signed by Taiwan’s Ministry of Transportation and Communications in Taipei during a trade and cultural mission in June. “I see this agreement as a small, but important step—one of many—that have been taken in recent times to make commerce, travel and tourism that much easier between Taiwan and the state of Washington,” Owen said. This is Washington’s fourth international driver license reciprocity agreement. The state has similar agreements with British Columbia, South Korea, and Germany. You are currently browsing the Licensing Express blog archives for August, 2014.